“Your People’s Lament” from his album Worldmaking. Gilbert Rendles, Behavioral Covenants in Congregations is a great resource for churches to speak directly about how to live in community. In other words, this passage is a part of a larger piece where Jesus is responding to the disciples’ question about greatness. It comes immediately before he talks about the extravagance of grace and the power of forgiveness. This is simply good sense. Jesus is teaching “Thou shalt not triangulate,” and uses a simple premise found in Deuteronomy (one witness isn’t reliable), and applies it to a personal relationship, and how we live in community. He is ordering the life of discipleship to be different from rest of culture. Sin has consequences. Unresolved sin must be addressed. Sin must be honestly confronted. There is debate over the words “against you.” This could be sins that are well known in the community, or sins that are about an interpersonal relationship. Since the response is a interpersonal response, it seems as if the “against you” is appropriately included in the text. Relationships that are loving must be honest. Without authenticity, a relationship is no longer healthy. Jesus is interested in the way we relate to each other, and this teaching reminds us that truthfulness is important. Vast implications for #Ferguson, and other places where systemic sin like racism, sexism, homophobia, and jingoism go unexamined. This is the reason “Love the sinner, hate the sin,” is a terrible compromise in issues of gender and sexuality. “...from shunning them, Jesus commands us never to give up on them, never to stop reaching out in love to them, always to yearn for grace to restore what has been broken. In the next few verses, Peter needs to make sure he has heard correctly. "Lord, if a brother sins against me how often should I forgive?" Jesus' "seventy times seven" response means "as long as it takes" (vv. 21-22).” Charles Hambrick-Stowe, Feasting on the Word – Year A, Volume 4: Season After Pentecost 2 . You cannot say to any member of the body- I have no need of you: (1 Cor. 12:12-26), but you are supposed to cut off your hand if it leads you to sinning...a tricky passage for sure. It seems like a strange aside that makes little sense. “Again I assure you that if two of you agree on earth about anything you ask, then my Father who is in heaven will do it for you. Yet we know (hope) that’s not what Jesus is saying, and we also know that God doesn’t grant every wish, even when we agree on that wish. “Verse 19 appears at first sight to be alien to this context… It can be paraphrased, ‘If two of you can come to an agreement regarding any disputed matter, that agreement will be blessed by my Father in heaven.” (Hare, p. 215). This isn’t about rubbing genie lamps. It is part of the context of disputes, and reminds those of the importance of community. The reminder that Christ is there foreshadows Christ’s post-resurrection presence in the community. It is a word of hope for those in dispute, that as long as they stay at the table to work out the conflict, Christ will be in their midst. Conflict is real, and it need not always be negative. How we handle conflict might be the single most important skill of pastoral leadership. Determining what conflict needs to be addressed, and how is extremely important, and probably should be taught more explicitly in seminaries. Forgiveness is hard work. Truth-telling is not easy, but it is vital if you are going to have an authentic relationship. This process should be held with the 7 times 70 admonition, because too often people either rush to forgiveness, which skips the process and isn’t healthy; or they hold onto grudges, which isn’t healthy. How does this compare to communion? Does your Holy Communion liturgy also communicate these things? Should it? Are people any more distracted now than they were at the time of Moses? Does communion remind people of God saving grace- what they are saved from and what they are saved for? The Israelites share the Passover with girded loins, sandals on and staves at the ready- preparing for what is to come. The Disciples break bread and share the cup with Jesus knowing his death is imminent. When we bread bread and celebrate God’s saving actions- are we prepared for what is to come? Communion Liturgy by Carol Penner (Leading in Worship) done in the “Passover style” i.e. what makes this night different? “Bo” by Joel Stanley - What’s it like to be the greatest sidekick ever? Actor and writer Joel Stanley takes us INSIDE the head of Aaron, Moses’s number one man (ahem…and his brother). Plagues! Confrontations! And poison-tinged political drama where Moses and Pharaoh's attendants attack each other…with snakes?? “Va’eira” by Rabbi Katie Mizrahi - Possibly the best known Bible story, period. 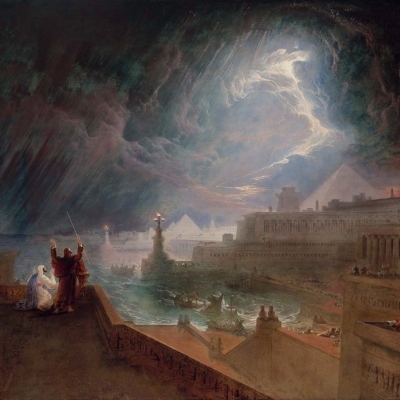 A rousing “Let my people go” kicks off weeks of frogs and hail and boils, but Rabbi Katie Mizrahi explains that those weren’t even the REAL plagues. ?#@$% Find out just what was afflicting those Israelites in this week’s story. What do we do to make places safe and sacred but not isolated or ignorant? Churches are dedicated when they are built- what about after that? How do we celebrate the passover without creating an us/them environment? ex: They are killed while we are saved. Chicago Bulls: What time is it? Game time! Grace and the community, Grace and the state, Grace and the Christian community, Grace and the secular community. Love and the law are tied together. Borg and Crossan point out that this passage is connected to the previous one (which the lectionary skips) about obeying authority. The verse “Don’t be in debt to anyone” comes right on the tail of admonishments to pay taxes. The expectation of the early church is something with which we are still living. A proper response to love is to live a certain way. This is not another list of things to avoid - Paul just spent 12 chapters trying to explain why faith is more than following rules. He’s not now replacing the Law with this moral code. “Dress yourself with the Lord Jesus Christ.” God as a garment, and article of clothing, something to put on for protection, identity, even fashion? The word fashion means to make something, to manipulate an object into something useful. To be “fashioned” into Christ - could this include our clothes? What do our clothes say about us? How do clothes communicate? People say they judge people by their character, not their clothes. These people lie. Lauren Winner’s book Wearing God explores this and many metaphors of God. For an example about how love and law are related, Joann Haejong Lee tells a story in the Christian Century about her curfew. She was given a rule - be home or call by 10 p.m., but one night she neglected to do so. Her father’s reaction helped to illustrate the point. The love he showed her that night - the palpable relief, the embrace - communicated a love that was so deep she wanted to follow the rule. Her desire to respond in love was more powerful in get than the fear of punishment. “In fact, the call to love is not an escape from our duties to one another. It's a call to live with even more intentionality and attention to the needs of others. We do so not because some rules or laws tell us we have to but because we have experienced that radical and welcoming love ourselves, and that love compels us to strive to be better.